Patient seemed very tired but welcomed me to her hospital room for her bedside venous Doppler exam. Her arm was massively swollen and had been since her hemodialysis access AVF creation in that arm seven days earlier. Actually, the swelling had grown over the time, tearing her arm open in two spots that had required stitching. She said the doctors believed the fistula was fine because they felt a good thrill (vibration), but were concerned there may be a deep venous thrombosis causing her arm to swell. The veins in her arm and shoulder looked fine, but a very large mass in her left upper arm was impossible to ignore. It contained mixed echoes but was mostly hypoechoic; it was so large in diameter that I could not fit it on the screen to measure it. At first, it looked like there was blood flow in the mass, but more investigation proved that the blood flow was instead part of the new fistula adjacent to it. The diameter of the fistula decreased significantly adjacent to the mass, and spectral Doppler velocities indicated a tight stenosis. Unfortunately, it appeared that the mass was compressing the new fistula. I let the doctors know immediately and they continued to use the Perm-a-Cath to dialyze the patient while antibiotics were given and the hematoma was allowed to resolve on its own. A follow-up ultrasound five months later showed that the diameter of the fistula had not returned to normal, and that flow was so diminished that hemodialysis was impossible. Her doctor expressed intention to attempt angioplasty to open up the fistula. For now, though, patient continues to use her internal jugular Perm-a-Cath. Recently, she announced that a family member had come forward and offered his kidney for transplant. They are currently awaiting compatibility matching and look forward to (hopefully!) her not needing to ever use her fistula. This course is designed to provide a detailed evaluation of dialysis access grafts, fistulas, and the mapping involved prior to surgery. 50 year old African American female. Swollen and painful left upper arm. Left upper arm hemodialysis access AVF with palpable thrill. End-stage renal disease secondary to lupus nephritis; history of mitral valve repair; on anticoagulation medication for atrial fibrillation. 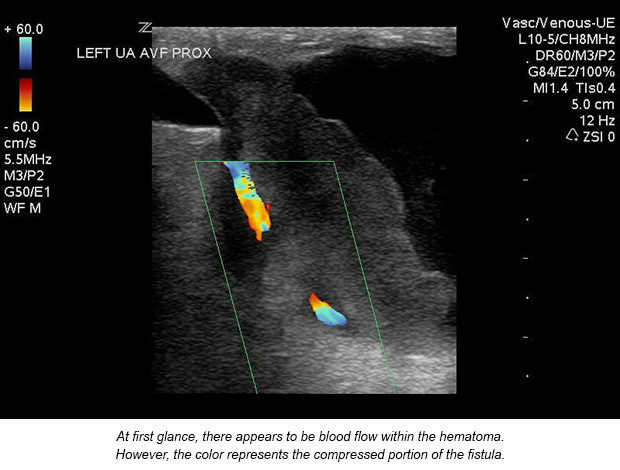 Left upper extremity venous Doppler for evaluation for deep venous thrombosis. The exam was performed at the patient’s bedside seven days post-op for a hemodialysis access AVF. No evidence of deep or superficial venous thrombosis was found. 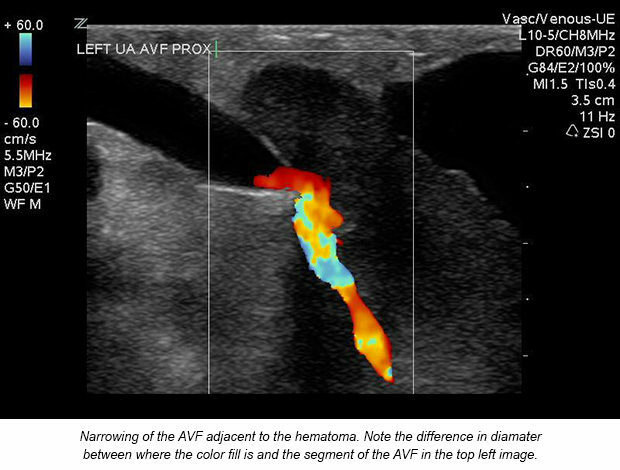 A 7.2 cm mostly solid avascular mass was identified and appeared to be compressing the fistula. A thorough investigation of the mass noting size, location, vascularity, and echogenicity is critical. A thrombosed pseudoaneurysm was considered as a differential diagnosis. The area was concluded to be an infected hematoma. A follow-up ultrasound five months later showed that the hematoma naturally resolved; however, the damage to the new fistula was too severe to regain a proper diameter. The patient is being dialyzed via Perm-a-Cath and is scheduled for angioplasty to attempt to dilate the fistula. She has stated that a family member has come forward and offered a kidney for transplant.